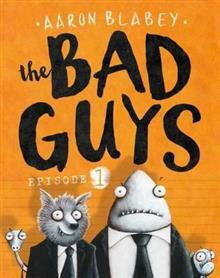 They sound like the Bad Guys, they look like the Bad Guys ...and they even smell like the Bad Guys. But Mr Wolf, Mr Piranha, Mr Snake and Mr Shark are about to change all of that! Mr Wolf has a daring plan for the Bad Guys first good mission. The gang are going to break 200 dogs ... read full description below. They sound like the Bad Guys, they look like the Bad Guys ...and they even smell like the Bad Guys. But Mr Wolf, Mr Piranha, Mr Snake and Mr Shark are about to change all of that! Mr Wolf has a daring plan for the Bad Guys first good mission. The gang are going to break 200 dogs out of the Maximum Security City Dog Pound. Will Operation Dog Pound go smoothly? Will the Bad Guys become the Good Guys? And will Mr Snake please spit out Mr Piranha?